Two-action tests of imitation compare groups that observe topographically different responses to a common manipulandum. The general aim of the two experiments reported here was to find a demonstrator-consistent responding effect in a procedure that could be elaborated to investigate aspects of what was learned about the demonstrated lever response. Experiment 1 was a pilot study with rats of a variant of the two-action method of investigating social learning about observed responses. Groups of observer rats (Rattus norvegicus) saw a demonstrator push a lever up or down for a food reward. When these observers were subsequently given access to the lever and rewarded for responses in both directions, their directional preferences were compared with two 'screen control' groups that were unable to see their demonstrators' behaviour. 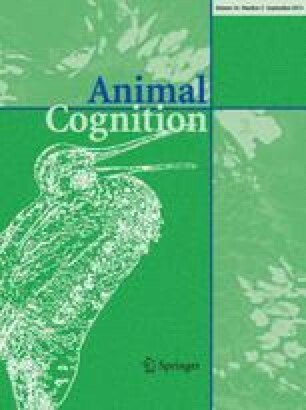 Demonstrator-consistent responding was found to be restricted to observers that were able to see demonstrator performance, suggesting that scent cues alone were insufficient to cue a preference for the demonstrators' response direction and thereby that the rats learned by observation about body movements (imitation) or lever movement (emulation). Experiment 2 assessed responding on two levers, one that had been manipulated by the demonstrator, and a second, transposed lever positioned some distance away. Demonstrator-consistent responding was abolished when actions were observed and performed in different parts of the apparatus, suggesting that observed movement was encoded allocentrically with respect to the apparatus rather than egocentrically with respect to the actor's body. With particular reference to the influence of scent cues, the results are discussed in relation to the strengths and weaknesses of this and other varieties of the two-action procedure as tests of imitation in animals and human infants.